Following my evening ski on Three Fingered Jack, I decided to head back north and try to hit some standard stuff on Rainier during the remaining day of high pressure on Tuesday, since I needed to fly out of SeaTac on Wednesday morning. Unfortunately, I didn't make it to Paradise until 1 am and so I slept in late, until finally wakened by the din of construction around 7:30 am. By 8:15 I was skinning up, but I could tell I was going to be too late to avoid the mushy snow, especially since it had not dropped below 58 F at Paradise all night. Also, there may still be an all-snow skinnable route to Muir, but I couldn't find it and so I needed 3 short carries across bare ground near and above Pan Point. I reached Camp Muir by 12:30 and skied down by 1 pm, with decent corn snow above 9000 ft. Unfortunately, as I turned onto the Paradise Glacier below Anvil Rock, the snow turned quickly to mush and it stayed heavy the rest of the way out. A couple of the usual big cracks have opened below Anvil Rock, but I crossed only a single other incipient crevasse on the rest of the run. I skied the safer southeasterly route towards Cowlitz Rocks, but looking up from the lower Paradise Glacier on the way out, I noticed that the more direct lines past the ice cliffs at the bottom of the upper Paradise Glacier were still in good shape. Skied onto the regular trail and then all the way out to the Paradise Valley Road at 5250 ft. I found a set of car keys just above Stevens-Van Trump Memorial, which looked like they had been in the snow for weeks or months. Sorry, I'm having a mental block and now can't remember what brand of car it was, but I turned them in to Paradise lost & found. 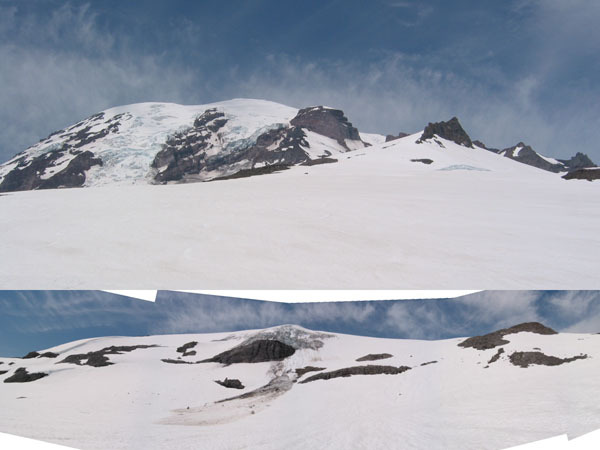 The upper part of this photo show the top of the Paradise Glacier, with the bergschrunds at right below Anvil Rock, while the panoramic lower part of the photo shows the ice cliffs at the toe of the upper glacier just below 7000 ft.